All roofs have a finite life and sooner or later the cost of continually patching up an old roof will overtake that of complete re-roofing. Moreover many older properties were constructed without proper underlay or insulation. A new roof enables the installation of these energy saving items as well as installing roof space ventilation to meet modern standards. 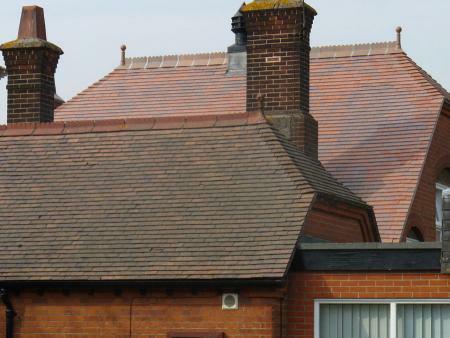 Clay tiles have been made at Dreadnought works since 1805, and an extensive list of re-roofing projects for Hotels, Schools, Churches, Civic Buildings and many more projects is available. W hen re-roofing or extending an old roof, the key is to replace or match "like with like". Shape, colour, size, weight and ornamental detail are the key factors. Tiles of the same clay are the best starting point. Old tiles will generally have been coloured naturally through control of the kiln atmosphere rather than through more modern techniques of spray on stains. Dreadnought natural clay colours are a still produced the traditional way and offer excellent matches to old tiles. The traditional character of Dreadnought tiles make them an appropriate replacement for the many brands of manufacture that are no longer available. Send us a picture of the tile you would like to match and we will let you know whether we can match it.